Of 13 editions so far, two have become touchstones in recent art history: the freewheeling fifth edition, curated by the Swiss Harald Szeemann in 1972, which equalized painting and sculpture with conceptual art and happenings; and the erudite 11th edition, organized by the Nigerian Okwui Enwezor in 2002, which propounded a global art ecosystem with Europe no longer at the center. But every Documenta, since the first in 1955, has served as a manifesto about art’s current relevance and direction, and everyone has taken place in Kassel, an unlovely town north of Frankfurt destroyed by Allied bombs in World War II. Until this year. The 14th edition of Documenta, led by the 46-year-old Polish curator Adam Szymczyk, is being shared by Kassel and Athens, a city with intertwined crises of finance and migration, and the capital of a country whose recent relations with Germany have been anything but collaborative. Daniel García Andújar’s “Disasters of War” at the National Museum of Contemporary Art in Athens. A full reckoning will have to wait until June, when the show’s second half opens in Kassel. This much I can say now: If the exhibition falls short (far short, in places) of the great editions of 1972 and 2002, Mr. Szymczyk’s decision to uproot Documenta was the right one. This Hellenized Documenta is sometimes forceful, often obscure, and in places exhaustingly proud of it. And yet the show’s most important themes -migration, debt, fraying European unity and the historical antecedents of today’s populism and intolerance- are ones Athenians have reckoned with for years. Now that those troubles span the world, Greece may be the best place to come to grips with them. There’s art by nearly 160 participants, almost all of whom will also show work in Kassel. For every familiar name, such as the American painters Vija Celmins, R. H. Quaytman and Stanley Whitney, there are 10 you’ve never heard of, often for good reason. It sprawls across 40 sites, as far afield as the port of Piraeus, though it’s most important is probably the new National Museum of Contemporary Art, or EMST, in an elegantly converted former brewery vacant for years. The accompanying bureaucratic and financial headaches are not incidental for Mr. Szymczyk, who opted to work with public institutions rather than Athens’s cash-flush private museums. Greece’s troubled relationship with Germany finds kitschy form in the EMST lobby. A large box there is filled with thousands of olives; the Argentine artist Marta Minujín, rather daftly, proposes Greeks could win debt cancellation with stone fruit. David Lamelas, another veteran Argentine, has rigged up a live feed at the entrance to the Conservatoire, showing debates in the Bundestag and the Hellenic Parliament -and a video of the Parthenon, looming as ever over this city. That third feed from the Acropolis is a reminder that the ties between this country and Germany are far older than the euro zone. A Bavarian was Greece’s first king, after the country won independence from the Ottomans two centuries ago. Art history itself, in fact, is a Greek-German invention; it was 18th-century Prussian aesthetes, most prominently Johann Joachim Winckelmann, who first systematized the art of the past, and placed Greece at the summit. The use and abuse of Classical antiquity, born in Greece and routed through Germany, therefore hums through Documenta 14. 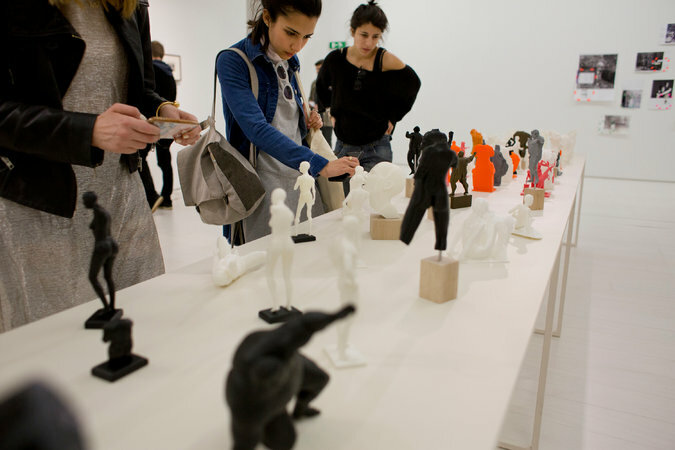 A much more thoughtful analyst of Classicism is Daniel García Andújar, of Spain, who has filled an EMST gallery with 3-D-printed statues of the “Farnese Hercules”, the “Boxer at Rest” and more deformed riffs on Greek art, plus banks of images that place Greek art within a dizzying network of nationalist imagery and racial classification. And everywhere, everywhere, bodies are in motion. The ongoing refugee crisis -a hopeless euphemism to describe the greatest moral failure of our time, which has left 65,3 million people displaced and pushed Greek social services to the breaking point- is inescapable in Documenta 14. Some artists here have responded poetically, including Peter Friedl. Other times it leads to self-righteousness or glibness, as with the wonky musical instruments made by Guillermo Galindo, a Mexican composer, incorporating tubes salvaged from a refugee camp near Kassel. While much of the rhetoric of Documenta 14 invokes a common humanity, “Glimpse” proposes that even the do-gooders have motives of their own. That is a sentiment many Athenians, skeptical of the intentions of this German-born megashow, will find easy to understand. All the same, one of the central aims of modern art has been to break through society’s assumptions, to imagine living as equals even if we never get there. It takes courage to get your hands dirty, even if you wash them clean later in your Airbnb.